Choosing appropriate retirement investment strategies can be a challenge even for investors who have been successful building their wealth for years. A shift in strategy from building a balance to investing for retirement income can require different strategies. Here are some common ways you can determine what the best investments for retirement income are for your specific situation. The first step of meeting your goals is determining what exactly they are via a retirement strategy. You will need to know how much income you need during retirement and how much your portfolio will need to provide. Start with an estimate of how much you would like to spend. Sometimes this is lower after retirement since mortgages are paid and kids are financially independent, although this isn’t always the case. Every day is Saturday now and the increased spending is certainly possible. When in doubt estimating 100% of your current needs is a good starting point for your retirement plan. If your actual expenses are lower in retirement, it’s always easier to adjust down. Next, you can subtract all the income your portfolio will not need to provide. Examples include your Social Security Benefits, any pensions or other income sources such as real estate. Once you know how much you need from your portfolio, you can get a rough estimate of how large a balance you need by dividing by 4%. This is because 4% is a commonly accepted “sustainable distribution rate” for those with a balanced portfolio retiring at a normal retirement age. Don’t see this as a dogmatic rule. You’ll adjust over time and will need to recalibrate your strategy if retiring in an unusually good or bad year, for example. During your early phases of accumulation, while you are building your balance, it is likely that you focused on returns. Perhaps you evaluated the success of your portfolio based on a common benchmark such as the performance of the overall market. As you approach or enter retirement consider a goals-based investing approach rather than one focused on returns. Are your needs for income being met, for example? If your retirement income strategy accomplishes your long-term investment goals, it may not matter how your returns compare to an external benchmark. The sources you choose for your withdrawals will have an enormous impact on your taxes in retirement. Hopefully, you have accumulated funds in multiple “pools” such as tax-free money, tax-deferred money, and taxable money. (A Roth IRA, Traditional IRA and Taxable account for example, although there are other examples of each type of retirement account.) If you do not, there may still be time to do Roth conversions or save additional funds in taxable accounts. Depending on your overall tax situation including in retirement from wages, Social Security, rental income or any other sources you have, you’ll be able to develop a strategy for how much money you need to take from each account type or “pool” to meet your income need. If you have a low tax liability, you may be more inclined to pull from your deferred accounts, for example. It isn’t always an either/or decision. 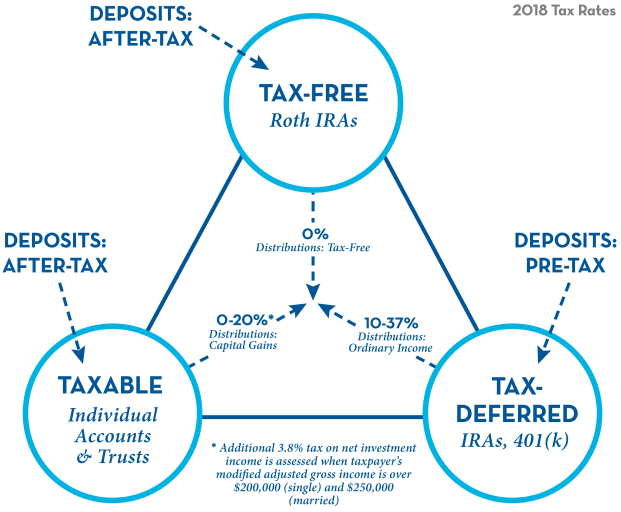 You may find in retirement that it makes sense to take from your deferred accounts up to a point (the top of a tax bracket, for example) and then consider withdrawals from taxable and tax-free accounts. If you plan efficiently, you might be able to withdraw the same amount as your neighbor, with substantially lower taxes. Many retirees are living longer and retiring earlier. This can mean that a larger portion of life is spent in retirement than may have been the case for previous generations. With longevity comes a need to focus even more on how inflation will affect your retirement savings over long periods of time. While inflation has been relatively low over the last decade, it should not be taken for granted that this will continue to be the case throughout an entire extended retirement. This reality is leading many investors to reconsider the degree to which equities may play a part in their long-term retirement investment strategy even once in retirement. The market risk associated with the asset class may prove a reasonable trade-off for the potential to keep up with inflation. As long as the portion you hold makes sense within your overall investment portfolio, equities may be an effective choice in investment strategy to ensure your portfolio continues to meet your long-term goals throughout retirement. Your initial assumptions about portfolios used in part or largely to produce income may be that they are inherently inactive and something that is set up and then forgotten, but this isn’t necessarily the case. You can benefit from reviewing your situation over time to better suit any changes in your life such as increases in spending or decreased expenses and changes in tax laws that may affect your long-term strategy and withdrawal frequency. Many investors are comfortable building a balance over time and making investment selections to meet this goal. They may find the withdrawal stage while in retirement a bit more challenging to navigate. Consider working with a qualified financial planner to determine the best course of action throughout your retirement planning process.